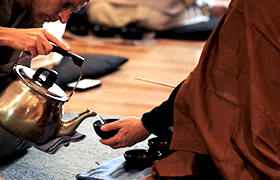 For February sesshin, in the spirit of Bodhidharma, practitioners are invited to connect even more intimately with zazen through the offering of extended silence and self-reliance. Throughout the week, the emphasis is on zazen; no talks or face-to-face interviews will be scheduled. Instead, we will allow our practice to be led by the deep winter silence. We will wake up each day long before dawn to begin a schedule that includes zazen, chanting services, formal silent meals in the zendo (oryoki), and work practice. This sesshin is an opportunity to draw from the tremendous strength of people practicing together and experience the deep stillness that lies within each one of us. This sesshin may be joined in progress as late as Friday evening. First-time sesshin participants should call the Training Office to set up a “sesshin interview” as part of the registration process.